Schneider supplies lead balls as versatile bulk weight and counterbalancing weight. In mechanical and plant engineering cavaties and gaps are often needed for a space-saving filling finish. Lead balls are a particularly economical material for this purpose. Lead balls can be poured quickly and with the a diameter of 2,5mm lead balls have already an approximate versatile bulk density of 7kg/dm³. The standard program comprises of diameters from 2.5 to 4.0 mm. Further dimensions can be produced on request. 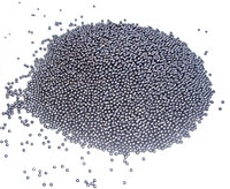 Higher apparent densities can be achieved by layered filling of lead balls of 10,0mm diameter and fine granulate of 0,4 up to 0,8mm. Lead balls are available in bags of 25kg each. In these bags lead balls can be stored space-saving and stable. Further dimensions and designs material on request.